As you can probably see by now, my love for Kimpton runs deep. It is my go-to hotel wherever I am traveling. Lucky for me, there were ten Kimpton hotels to choose from in Washington DC. 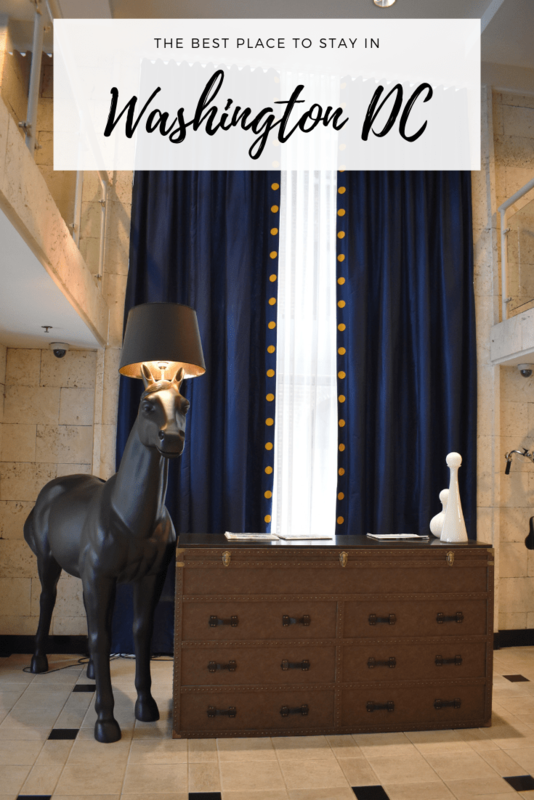 Although Kimpton is a chain, each hotel is completely unique with their own funky decor. The only thing that is similar is the superior quality, excellent service and, most importantly, free wine hour. I chose the George Hotel because of its close proximity to the Capital, which is where we began our walking tour. They were also having an amazing deal that was too good to pass up. If you book a three night stay, the third night is free. That brought the average cost per night down to $112 per night, which is basically highway robbery. Our room was very spacious- two queen sized beds and a sofa that had a full size pull out bed. My son tends to sleep sideways and kicks me in the gut, so the extra sleeping space was a big plus. The bathroom had a full size tub and stand up shower. I am so used to having closet-sized accommodations in cities so the space was great. I loved the decor in this hotel. Our throw pillows were made to look like George Washington’s lapel. It was so fun for my son to have the presidential theme in Washington DC. There is a nice French restaurant in the lobby and that is the only food for room service. That was difficult with a picky eater. He basically ate buttered pasta every night. We ended up walking across the street to Union Station for meals because there was so much variety offered. DC has such great eateries that are considered fast food but they are still very healthy. We loved the salad bar Chopt and Cava Mediterranean. Right beside the hotel, there is a breakfast place called The Corner Bakery. It was so handy to run down for coffee and bagels each morning. We loved our stay at the George Hotel. We try to visit Washington DC each year and I am already torn whether to return to the George or try one of the other Kimpton hotels. Whichever Kimpton you choose, you simply can’t go wrong!